Every sport requires a different set of skills to overcome the challenges of the game. Some say that hitting a baseball moving ninety miles an hour with a cylinder shaped bat is the hardest feat in any sport. Then there are those who speak of the mental toughness needed to play par golf. Hunting also has its tests, since much care must be taken to assure that the query doesn’t hear, smell or see the stalker. Fishing is a sport so difficult that catching a single fish is a good day for some, and landing a three pound bass is a lifetime achievement for others. Don’t feel badly the next time you tell someone you didn’t get a bite, because catching fish isn’t easy. Fishing might be the most difficult sport of all, considering that most of the time you can’t even see your opponent. In fact, you don’t even know if the fish will be there when you go fishing. Unlike football or soccer where the other team must be on the field to play the game, fish can be anywhere. Thus, the angler is often casting in a barren body of water with little chance of catching anything. So what does one do? Most answer the call by buying more tackle, better electronics, and bigger boats, while others seek free advice from anyone who will oblige. That’s not a bad start, but nothing beats study, practice and experience. That’s why successful fishermen know everything there is to know about the life cycle, migration patterns and feeding habits of the species they are targeting. In addition, they spend countless hours on the water learning through experience where their invisible quarry spends its days, nights and seasons. Unlike stick and ball sports that begin at a specific time and place, fishing has no such schedule. There are no rule books to follow. Fish play (bite) only when, how and where they want to, or not at all. Those are the most frustrating days for the novice, particularly when they learn that the fish began biting an hour after they left the area. The only unwritten rule is that fish bite on their own schedule, one that is never posted. In any other sport, fish would be disqualified for rule violations. But in the lopsided pastime called fishing, the fish blow the whistles and the only flags thrown are against the anglers. Upcoming Events: Free fishing seminar – “Using Sonar, Down Scan, Structure Scan and GPS To Catch More Fish In 2015” – Jake Bussolini and I will discuss the theory and practical application of locating and landing fish with the aid of electronics. This ninety-minute session will begin at 6:30 p.m. on January 21st at Gander Mountain, Exit 36 in Mooresville, NC. For additional information, call 704 658 0822. Fishing this January will be no different. Plenty of bass, perch, stripers and hybrids will come from the warm waters adjacent to the Marshall and McGuire Power Plants. In addition to the warm water discharge channels (Hot Holes), Ramsey and McCreary Creeks are productive locales in January. Not all fish find their way to the “Hot Holes”. The majority will be taken by anglers who retrieve slow moving baits near deep water docks, humps, points and channel runs. The opportunistic anglers will stop to cast their lures under droves of diving sea birds. Tips from Capt. Gus! Don’t let the fish know you’re fishing for them! Lake Conditions: The water level on Lake Norman is about 3.0 feet below full pond and is 2.4 feet below full on Mountain Island Lake. The surface water temperature is in the high forties and low fifties in water not affected by power generation on Lake Norman. Capt. 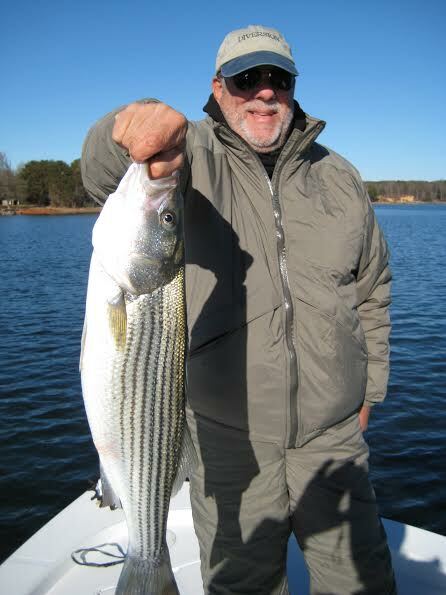 Gus Gustafson of Lake Norman Ventures, Inc. is an Outdoor Columnist and a full time Professional Fishing Guide on Lake Norman, NC. Visit his website at www.Fishingwithgus.com or call 704-617-6812. For additional information, e-mail him at Gus@lakenorman.com.